When bed bugs travel from one place to another, there might not be many bed bugs in the beginning. An infestation might not happen for a short period of time and it is the best way to use a list of bed bug detection methods. The best way to get rid of bed bugs is before an infestation starts. Bed bugs can spread from one object to an entire building. The presence of bed bugs is rising around the country. 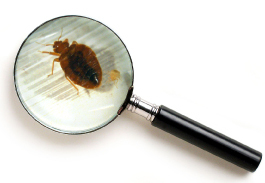 There are several methods that pest control companies can partake to detect bed bugs. First is a thorough visual inspection throughout the building or home. A visual inspection can be tricky sometimes because those doing the inspection need to inspect every inch of an area. Bed bugs scatter when they know someone is close and can hide very well. With the proper tools, evidence of shedding can be found in the form of light brown bug shaped broken pieces. Using a visual inspection can be difficult to inspect but with the help of the right tools and knowing what to look for you can find trails of bed bugs living in your environment. Bed Bug sniffing dogs is another method that is successful. Bed Bug sniffing dogs are trained to alert when a odor is present and can find bed bugs that are hiding in concentrated areas. The handler and the bed bug dog can work together to pin point where bed bugs are before an infestation spreads. Applying the appropriate amount of heat evenly throughout a structure can kill bed bugs and their eggs wherever they are hiding in a single treatment. Using heat for pest control is an effective and safe alternative and a great method to use when trying to kill bed bugs and bed bugs that are hiding through crevices and in hard to reach places. People can greatly be affected by bed bug bites and can exhibit allergic reactions and sores.Using several methods with the proper tools can prevent a bed bug infestation and prevent people from being negatively affected by bed bug bites. At Alliance Environmental, we have a lot of work to do. Our Team Heat Division specializes in eliminating bed bugs by using the heat method.